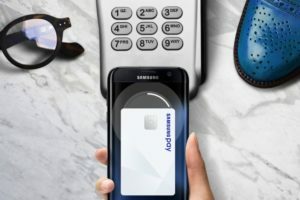 To use Samsung Pay the customer adds their payment cards in the app in their unit. When they want to pay in an OPEN payment terminal they hold their unit at the side of the payment terminal. The payment terminal lights up and the customer writes in their code and approve of the purchase. The purchase is verified with an iris scanning or with a fingerprint in the Samsung unit. See clip below on how to charge customers paying with Samsung Pay on a payment terminal.